COUNTRIFIED 'You will never come to one of our shows and see us staring at our feet,' says Josh Peyton, center. The Reverend Josh Peyton learned a long time ago that there's more to music than playing an instrument and writing songs. "When I was a kid, I'd go to see shows and I started to figure some things out," he said in a recent phone interview. "I realized early on to be good, you've got to be good on your instrument, you've got to be good at writing songs and you have to put on a show." That's why the Reverend Peyton's Big Damn Band brings not only its solid country blues songs, but also delivers a dynamic, high-energy and entertaining show each time it hits the stage. 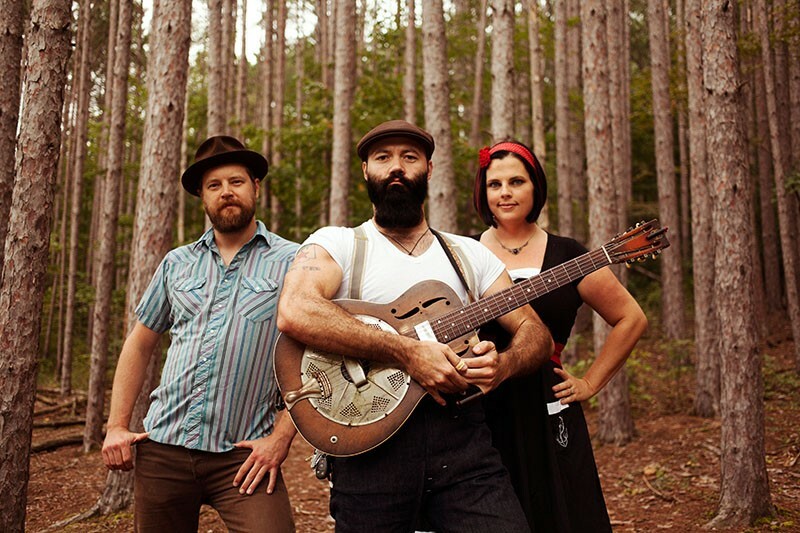 When they hit the stage, Peyton, his washboard-playing wife Breezy and drummer Ben "Bird Dog" Russell aim at getting the audience moving rather than just standing and staring. "You will never come to one of our shows and see us staring at our feet, acting like the audience isn't there or we don't care," Peyton said. "When I see a band doing that, it makes me mad. I literally get mad. I get angry. That's not at all what it's about." Of course, good music doesn't hurt, and the current release, So Delicious, is the band's eighth full-length release and its first under a new deal with Yazoo Records. It's the group's best effort yet and the first album that captures what the trio, which formed in 2003 in the Indianapolis, Indiana, area, sounds like live. "Our early records were like field recordings," Peyton said "We'd throw up mics and play live. It actually takes more effort to make it feel live than just throwing up mics. Over the years, we've learned that." Among the most notable songs on the record are the charming down-home-in-the-kitchen ramble "Pot Roast and Kisses" — "If you can listen to that song and not at least smile, maybe you and I are so far apart we should see other people," Peyton said — and the country blues march "Raise a Little Hell" on which the band is joined by a children's choir. There's no kid's choir on the road with the Big Damn Band. But Peyton is confident that the band will connect with audiences on multiple levels, just as it does on the record. "The kind of stuff I like to go see, it really makes you feel something," Peyton said. "There's music for your head, for your heart and there's music for your gut, too. I want to do it so it's all of those, so you really feel something. I think the best stuff is that way." Reverend Peyton's Big Damn Band plays the Mystic Theater Oct. 20–21 Petaluma Blvd North, Petaluma. 707.765.2121. $17.